SQM-L 18.5: Apparent with brighter center, appeared relatively small. Evident, round, diffuse brightening with rather compact, brighter center. Several stars seen with averted vision, background still diffuse. Somewhat smaller than M38. Together with M37 & M38 an awesome view. Despite an altitude of 11° easily seen. Obvious, bright, diffuse, not resolved. Quite evident, consists of brighter and moderately bright stars, slightly concentrated toward the middle, irregular, outstanding star chain. Awesome under dark skies. Under light polluted skies the cluster gets more lost due to its fainter members. SQM-L 18.5: Barely visible with direct vision, relatively large, diffuse, somewhat brighter center. Evident, round, relatively large, diffuse brightening with somewhat brighter center. Not resolvable. Together with M36 & M38 an awesome view. Evident with brighter star in the middle. With averted vision many fine stars. The background appeared partly diffuse, partly granulous. Well resolved with averted vision and quite conspicuous. Very rich with many faint members. Central star outstanding. Evident, but overall quite faint. Many fainter members visible with averted vision, similar in brightness, almost evenly distributed. At 18x central star quite obvious, cluster itself appeared more as a granulous, almost round brightening. At 50x well resolvable with many faint members. SQM-L 18.5: Relatively faint, evenly bright, diffuse. Evident, almost evenly bright, irregular shape. Some stars seen with averted vision, otherwise diffuse. Somewhat larger than M36. Together with M36 & M37 an awesome view. Altitude of about 13°. 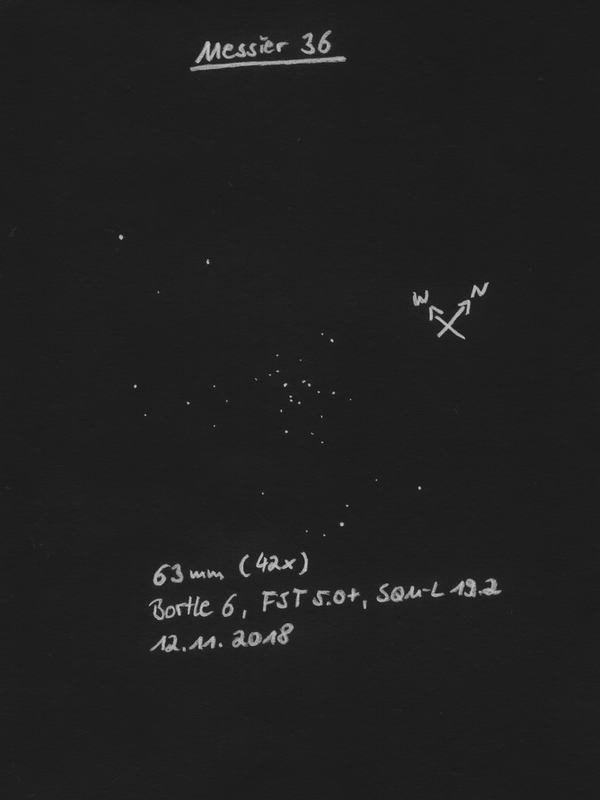 Similar to M36, but larger and fainter. Relatively evident, diffuse, not resolved. 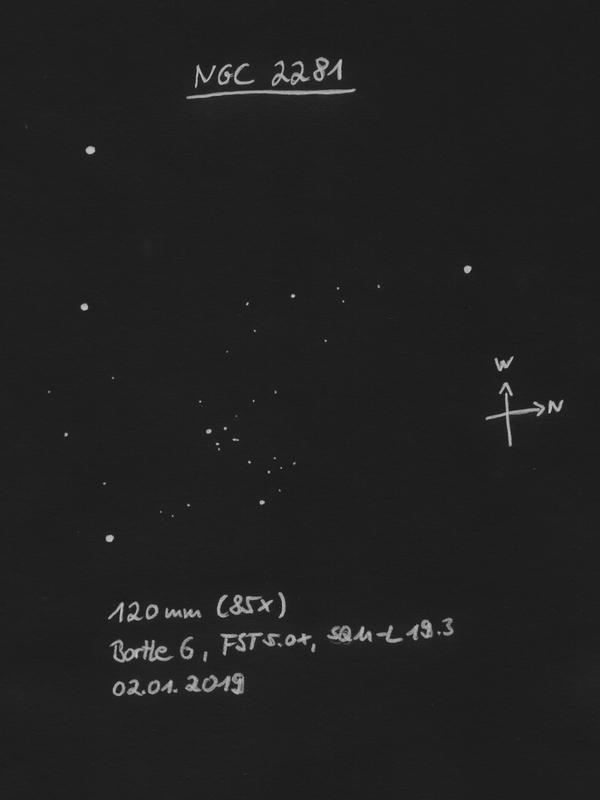 Concentrated toward the center with radial star chains, so that the shape of the cluster appears irregular. At 50x there was an apparent star in the center with no stars in the direct vicinity (like a hole in the center). Rather faint members. The cluster is more dominated by star chains, so it appears more irregular. Quite evident, rather faint, resolved. At 23x pretty faint near a medium bright star, appeared rich, but not very evident. At 50x irregular with several star chains. Background still slightly nebulous. About 20 stars visible. Fairly well seen with averted vision as small, diffuse brightening. At 20x quite small, diffuse, slightly oval brightening. 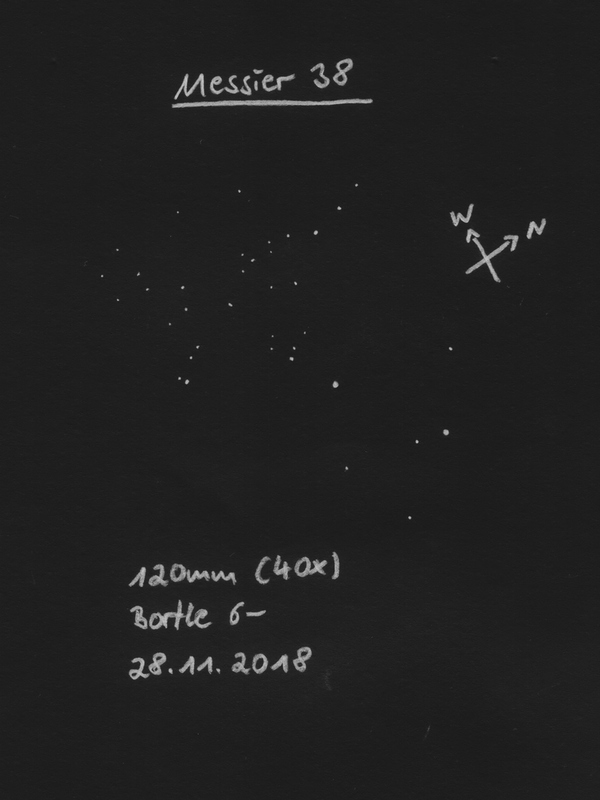 At 50x I could saw two stars (probably the two stars at the south edge) of similar brightness, otherwise the cluster appeared very diffuse. Nearby a star pair, evenly bright oval. Already at 23x quite apparent with at least 20 medium bright and fainter members. It appeared rather irregular and the 'broken heart' was well seen. I made a sketch at 85x, whereby the 'broken heart' was not so conspicuous.